Background: Because line width has been close to atom size, for semiconductor industry, except for achieving the target of line width, the cost will be more important. 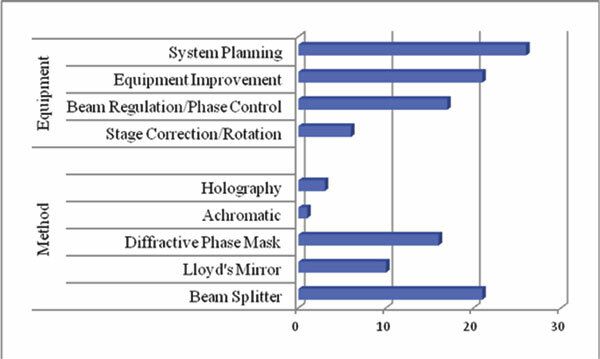 The mask-less laser interference lithography (LIL) technique lowers the cost makes it standing out in the market of lithographic equipment of the excessive cost in the semiconductor industry. Method: The Keywords of patent retrieval with the theme of LIL are based on the technical features of both the conditions of producing interference lithography and different types of experimental configuration of LIL. Method of patent retrieval include Boolean logic operators are used to express the relationship between sets. Furthermore, it's necessary to find whether common patent classification codes exist in the highly correlated patents and confirm the definition of that. Results: The patent review in this research show the patents of LIL technique are classified according to optical method and lithographic equipment. The patents related to optical method of LIL technique take beam splitter based configuration as the main stream; in the technique of lithographic equipment, the patents of system planning technique are the most. Conclusion: The findings of this review confirm the importance of improving the precision of LIL technique for avoiding the defocus of high-density line width. Besides, it’s particularly suitable for the micro nanofluid device in the emerging bionanotechnology to observe fluid behavior at the minimum scale. It doesn’t need mask and can produce periodic pattern with nanoscale make it devote to the field of periodicity. Laser interference lithography, maskless, nanoscale, nanostructure, nanotechnology, patent search, patent review, periodic.